Call it amazingly good timing but I got a new product to try yesterday. Amazing since I can take the first three weeks of this month to test it out. I mentioned a few posts back that I was under consideration for a mini vox box from Influenster.com. I knew it would be about dental care because that was the mini survey but the product itself was a mystery till I got home from class last night. There's an update with class too but I'll get to that later. 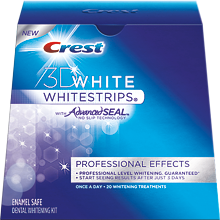 Turns out it was an opportunity to whiten my teeth using Crest 3D White Professional Effects whitening strips (with advanced seal--not sure if that matters but they are sealed pretty tight to my teeth). Oh and since this post will be super long there's a break immediately after the photo--please click for the full review and other information. Anyhoo, the strips are pretty thin in their packages but I'll say it feels a little odd to have something on my teeth that I deliberately put there. They aren't uncomfortable and I can still chat and do normal things while they are on. I'm not drinking anything while they are on but it's mostly because my mouth feels weird. There's a strip for your upper and lower set of teeth (of course they are really only covering the front teeth but that's where people capture our pearly whites during a smile anyway right) and they stick pretty easy as long as you aren't wimpy when you apply them like I was initially tonight. I'll do better tomorrow lol. They have been on about ten minutes as I type this so another ten minutes to go before it's time to remove the strips. It does slightly feel like they melt to your teeth a bit the longer they are on but that could be a good thing in the long run. Just so I had an image of what day one looked like versus day 20 I took a smile shot. And I took another shot with the strips on--may not be super clear sorry about that. So here's to day one almost down and 19 more to go. Twenty minutes goes by a lot quicker than I thought it would but if I had small people or folks I needed to talk to for long periods of time I might have waited until later to do them before bed. Or at least after dinner--doh forgot about food. I got word today that four or five new clients can be added to my paltry case load and found out that after chatting with one of the local folks that I could teach another class in a few weeks which will keep offsetting whatever I'm not making with full time gig. I'm still planning on getting myself into teaching full time eventually but gotta build up my research credibility ASAP. After this course is over I'll explore what I can do through the adjunct position and networking with other people. And I found out that my stomach bug hit one of the places I see clients like the plague last week and is still running amok a bit. Glad to know (and horribly sad for them simultaneously) I wasn't alone. Oh and I finally got my Lemon Creme Oreos in the mail yesterday too but I was on a sugar rush from class's mini Halloween and Happy Birthday to my adorable niece fest. Look at that, I rambled long enough in the post to be able to take off the strips lol. Okay I'll stop babbling now. Have a good night all.